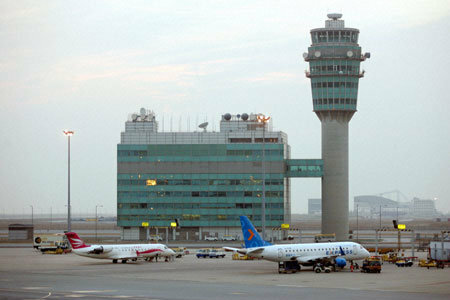 A high-level overview of the impact of the new terminal on the performance of existing air traffic control systems, including voice communications, navigational aids and radar surveillance. A detailed assessment of which areas of the airfield will not be covered by the ground movement surveillance system as a result of building the new terminal. A detailed assessment of the CAT III instrument landing systems to ensure the runways would retain CAT III status after the building of the new terminal. Detailed designs for the system changes required to mitigate the impact on the air traffic control systems. As the building of the new terminal progressed, Hong Kong International Airport benefited from maintaining smooth operations, but the two runways were not working as efficiently as possible. Due to the rapid growth in the region HKIA needed to increase capacity by over 60% in a very short time and again enlisted the support of NATS to achieve this. By working closely with CAD and Airport Authority HKIA (AAHKIA), NATS was able to optimise the operation significantly in most areas. This included revising the SIDS/STARS at HKIA and improving the ground/traffic movements from an original peak hourly capacity of 48 movements, progressing to 60+ and moving towards achieving 115.